I found this puzzle on internet. 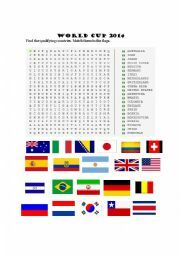 I added the flags for students to matc them to the countries and I also added the chart. I hope it´s useful. 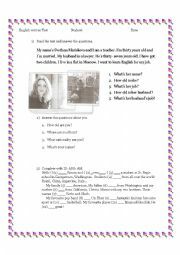 This worksheet is about negative sentence and questions in the Present Simple Tense. 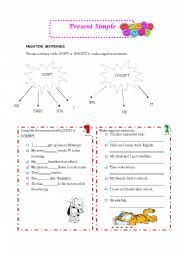 This worksheet contains a reading comprehension about a family and it´s related to the verb have got. 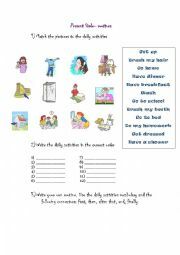 It also has got some exercises about the verb "have got"and an exercise about family members. 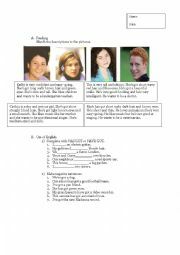 This is a very simple test I prepared for my elementary students at a private English institute. It contains a reading comprehension and a simple writing about describing people. It also has grammar exercises relating to the verb "Have got" and possessive adjetives and pronouns. 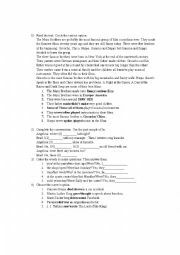 This whorksheet consists of a series of exercises about the present simple tense. these exercises are about grammar and vocaluray. Also, there is a reading comprehension with activities to solve. 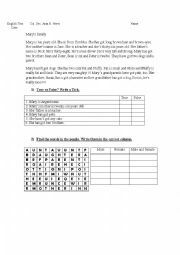 This worksheet consists of past simple exercises about past simple regular and irregluar verbs and the past of "be". you can also find a reading comprehension about the Marx brothers, the famous film comedians. This is a test for my adults students. There is a reading comprehension activity and the main topic is to be. There is also a writing about personal information. 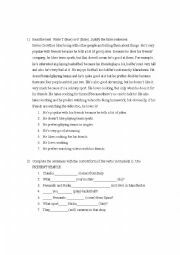 This worksheet includes exercises about the past simple tense mainly grammar exercises and an activity related to adjectives to give opinions about different kind of books. 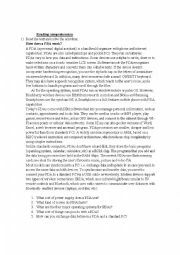 This worksheet contains a reading comprehension about PDAs since it was made for students at college who are learning software programming. The exercises about vocabulary are also related to the topic.